The BBC has asked the White House to review the security protocol for President Donald Trump's political rallies after one of its cameramen was attacked Tuesday night. 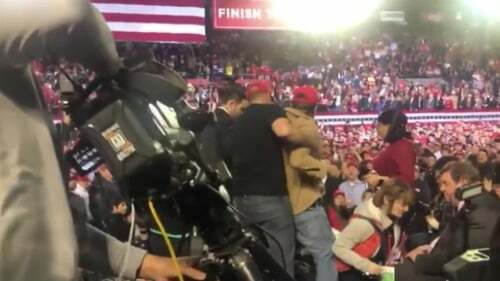 Skeans was unhurt and the assailant, who was wearing a "Make America Great Again" hat, was restrained by a blogger for the pro-Trump outlet Frontline America and removed from the media riser. The attacker was apprehended immediately, and while being grappled from behind he shouted "USA" and "F*** the media". The BBC's Ron Skeans was working in the area of a raised camera platform at Trump's campaign event when, he says, a "very hard shove" came out of nowhere. "He is made of stern stuff", he told BBC Radio. Video that appeared to be from Skeans' camera showed it falling toward the ground. "I really wish I didn't have to introduce this, but we have seen rhetoric from the president declaring the media as the 'enemy of the state, '" Swalwell said. Speaking to a packed stadium that holds about 8,000 in El Paso, Trump slammed the "dishonest media" in his remarks. Prior to the attack, Trump said, "We have suffered a totally dishonest media and we've won and it's driving them insane, driving them insane". Here is how Trump reacted when a BBC reporter was attacked at his rally last night. An official with the president's campaign suggested the man in the video was drunk, according to the BBC. O'Donoghue said Monday night wasn't the first time journalists had been singled out at a Trump rally. Washington correspondent Gary O'Donoghue, said his colleague Ron Skeans had been filming the rally when he was pushed to the ground by a Trump supporter. However, BBC Washington Editor Eleanor Montague, whom he was with, told BBC the protester had attacked other crews within the rally but Skean "got the brunt of it". Skeans is listed as a member of the White House News Photographers Association. "As we continue to look into what happened, we firmly denounce all physical violence against reporters for doing their jobs", the group said in a tweet. Mr. Brown called on Mr. Trump "to stop the encouraging of violence at these rallies".